The Kinect Star Wars special edition Xbox 360 bundle will launch on April 3rd, almost six months after it was scheduled to go on sale. 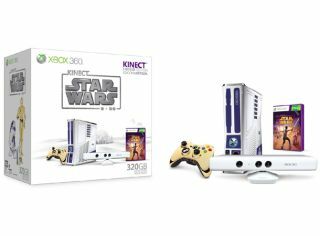 The bundle includes a copy of Kinect Star Wars, an R2-D2 custom-designed 250GB Xbox 360 console, a C-3PO-inspired gold controller and a Stormtrooper white Kinect peripheral. The limited edition pack was announced last July ahead of a planned November release, but delays in the game's production forced Microsoft and LucasArts to push the launch back until 2012. The news comes from Microsoft's Major Nelson, who also revealed some intriguing new features for the game's Jedi Destiny mode. "New Duels of Fate mode, a battle-by-battle experience to sharpen your Jedi skills against the Dark Side. "New Galactic Dance Off mode loaded with Star Wars-themed pop tunes where those still honing their Jedi skills can take a break to battle Darth Vader on the dance floor or bust a move "Solo style."" News of the official release date and new features come as Star Wars prepares to return to the big screen with the re-release of The Phantom Menace in 3D on Friday. US-based Force loyalists will be able to go hands-on with the new Kinect Star Wars game at selected AMC cinemas across the country as part of a Star Wars theme day.